Hairy goats, of the Saanen and Toggenburg breeds, have been imported periodically from Switzerland and other European countries; these breed undoubtedly contributed much to the formation of various groups and varieties of goats specialized in milk production. 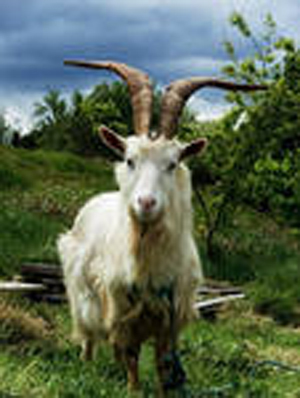 In addition, people in both the European and Asian parts of the USSR have been raising milk goats for centuries. Separate groups of goats have formed under the influence of various feeding and management methods, and on the basis of different origins. Dairy goats in central and northwestern Russia, have strong, dry constitution and a harmonious conformation characteristic of the milk type. They have a light and narrow head. The neck is long and straight and the sacrum wide. The udder is big and smooth; quarters are proportionally developed and teats are wide-set. The legs are strong. The positions of the front and hind limbs is regular. The skeleton is strong. The coat is composed of coarse short, or occasionally long, hair, which is usually white. Animals may be hornless or horned. They resemble Saanen goats in appearance. Typical of this group are the animals found on private plots in Gorki, Leningrad, Moscow and Yaroslavl regions. They are typical milk goats. Live weight of adult females is 50-60 kg, males 60-75 kg. They average 550 kg of milk per lactation and the best animals up to 1,000 kg. Fat content is high - 4.2-5.3%. Milk goats are prolific: 100 females give birth to 190-220 kids. Some goats kid twice a year. Cases have been recorded of up to six normal kids at one kidding. Dairy goats in the North Caucasus, Crimea and Central Asia are somewhat smaller, have hair of various colors but are inferior in productivity to the goats of Gorki, Moscow, Yaroslavl and Leningrad regions. There are goats there which have a wool undercoat and, consequently, double utility: they are milked and, in addition, yield about 100-150 g of fiber per head. Milk yields per lactation are in the range 250-400 kg with a fat content of 3.5-5.5%. The average live weight does not exceed 40-42 kg.